This will be a rare sight to see on the weekend television when the power from 3 Khans of bollywood: Salman, Aamir and Imran will be seen together on Dus Ka Dum. It was all smiles affair as the trio went on to play the game ‘Dus Ka Dum’. Aamir and Salman bonding was the highlight. 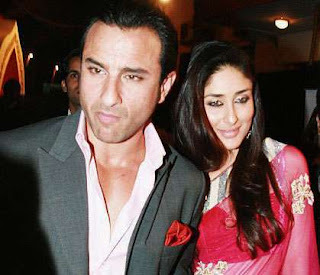 Saif-Bebo: Lovebirds or party animals? Hand-in-hand they walked into Manish Malhotra’s show and they continued doing so at the postparty on Saturday night for the Lakme Fashion Week Fall/Winter 2008. We’re talking about Saif Ali Khan and Kareena Kapoor, the ‘it’ couple around town. While the two were very late for the show, they arrived pretty early at the party, in fact, one of the very first to arrive! Jaane Tu...Ya Jaane Na is the launch pad of Aamir Khan's nephew Imraan and to play it safe, Aamir has roped in A.R. Rahman for the music. Set against a campus backdrop, the film's music gives us an insight into the other side of the composer. Newcomer Rashid Ali can thank Rahman for a great debut as he croons to Kabhi kabhi aditi, a romantic fun piece. The track doesn't sound much like a Rahman composition, but is nevertheless an enjoyable song as Rashid's vocals gives it a youthful touch. Lyricist Abbas Tyrewala ensures sure his lyrics don't disappoint either. Rakhi Sawant has come a long way since that very notorious "kiss ka kissa" with Mika. She has made all the right moves and appeared in all the right places to become famous. People started loving her "nakhras" and "nautankis" on TV since the "Big Boss" episode! Well, she was earlier known only as an item girl, but, has now moved on to bigger and better things. What with reality, TV shows, Dance competitions (nach baliye) and Yeh hai jalwa, where she stood her own. she also appeared in a movie "Budha Mar Gaya" where she played a small but important role. She has proved beyond doubt that she can do anything that she puts her mind to do! Well, she is at it again, and this time she is coming out with her own talk show on TV. What's it going to be? The Rakhi Sawant Show? Guess, only time will tell. So, who's the first guest of honor on this talk show of hers? Aamir Khan! Yes, its Aamir himself who agreed to appear in her first episode of her talk show. They apparently have a lot in common, from controversies, to being charming, and the only difference being, (according to Rakhi) that she is a female and he is a male. Now, this is one show that I definitely would NOT like to miss.